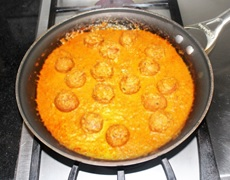 Masoor dal kofta is a marvelous unique dish. These koftas taste delicious and go well with any Indian bread. 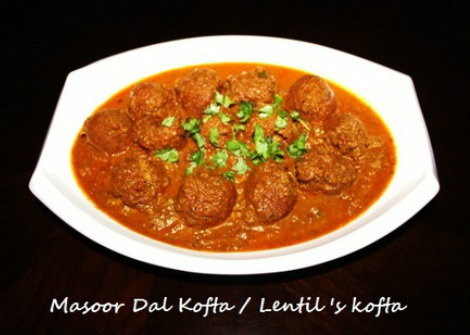 Masoor dal kofta looks like meatball koftas and are the vegetarian alternative to meatballs. For making these kofta's first Masoor dal is soaked then grinded then besan and spices are mixed in the dough, with the dough kofta balls are made and deep fried, then koftas balls are simmered in spicy gravy. 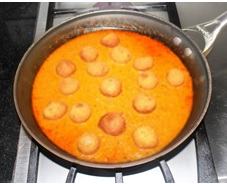 Masoor dal kofta taste totally different then Masoor dal, you can prepare this when entertaining guest or for the parties. It takes little time to make the koftas but it is well worth the effort. dal is soaked wash and rinse, drain all the water out. smooth paste. Paste is not thick enough to make balls we need to dry the water. from lumps. Turn the stove off, and remove the frying pan from the stove. mash if there is any lumps. in to 10 to 12 equal portion without forming the balls. time and roll into small balls, place them on the plate. spatula flip balls around few times, balls should be fried on medium high heat. If the heat is low then the balls will break. absorbed. It takes about 4 to 5 minutes to fry the balls. other batch of balls fried quickly. them fry. Repeat the process until all the balls are fried. 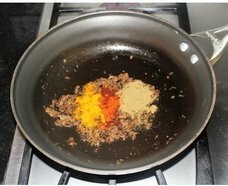 turmeric powder and mix with fried onion and fry for few seconds. minutes while stirring occasionally. Milk binds the gravy with onion masala. to the desired consistency. Bring the gravy to boil, turn the heat off. 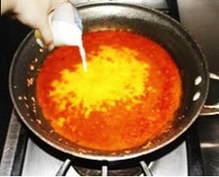 out from recipe, the dish will still taste delicious.